Sean O'Brien, Iain Henderson, Johnny Sexton and Dave Kearney crossed to secure the try bonus point in just 35 minutes, before Sean Cronin, Rob Kearney and Jared Payne completed the rout. Ireland captain Paul O'Connell was sin-binned for an unwitting but ultimately cynical offside, both teams' totems slipping off the disciplinary tightrope though remarkably without a punch in sight. Lynchpin Sexton hit top form as Ireland sauntered home, shrugging off a lacklustre set of warm-up matches which ended in consecutive defeats to Wales and England. Ireland's victory, worth five points, was the perfect start to Pool D, with a straightforward clash against Romania next before the pivotal battles with Italy and France. Cudmore's yellow card killed any chance of a Canada upset, the captain given his marching orders for handling in the ruck on his line. O'Connell's yellow card was more instinctive as he seized an intercept from an offside position at the top of the second half. The act was cynical in truth however, and not the kind of play head coach Schmidt will want repeated. Cudmore and O'Connell famously slugged it out in one of European rugby's biggest-ever punch-ups in 2008, when the Canadian was sent off at Munster in action for Clermont. O'Connell was handed a yellow card for that incident, and Cudmore has since launched a wine business aptly named 'Sin-Bin'. There was an inevitability about disciplinary wrangles for the two behemoths, but none of the customary niggle that has coloured their engaging contests of the past. Once Cudmore was sent to the stands, Ireland seized full control. O'Brien drove home from the lineout, Sexton converted and Canada knew they were in trouble. Henderson powered home for Ireland's second try moments later, after another punishing scrum from Schmidt's men. 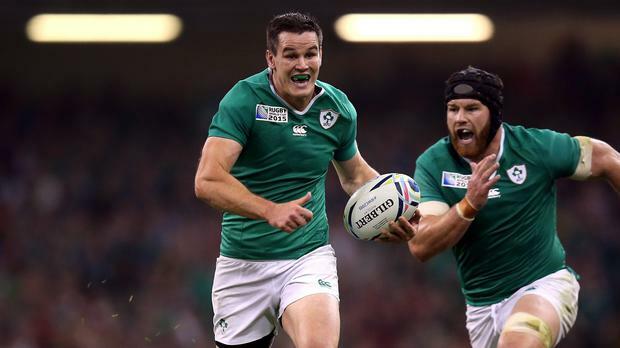 Sexton exchanged passes with O'Brien to race away for Ireland's third, Canada completely overwhelmed by Cudmore's sin-binning. Dave Kearney sauntered in for Ireland's bonus-point fourth score with five minutes to spare in the half, Cudmore's reappearance doing little to boost Canada's chances. DTH Van der Merwe thought he had scored for Canada at the death of the half, but Nathan Hirayama's tap-pass travelled forward and the try was chalked off. Ireland handed themselves the worst possible opening to the second half, captain O'Connell sin-binned for cynically intercepting the ball from an offside position. The Toulon-bound player's interjection may have been instinct, but it still proved costly. Ireland were able to ride out Canada's initial wave of attacks, but the match fractured badly with the error count rising steadily. Canada were unable to take advantage of O'Connell's sin-binning however, Ireland holding impressively firm. Ian Madigan replaced Sexton ahead of the hour, a clear statement of satisfaction from taskmaster boss Schmidt. Bigger challenges await and Schmidt knows full well Ireland will struggle to function without Sexton's wit and acumen. Cian Healy joined the fray on the hour, his first outing since neck surgery in May. Jebb Sinclair celebrated wildly in dotting down over the line, only for his effort to be ruled out for a clear offside. Cronin burrowed home for Ireland's fifth try with a quarter-hour left on the clock, Madigan posting the conversion too. Van der Merwe claimed an intercept try to console the hard-working Canadians who fought throughout to play open and flowing rugby. The Scarlets wing raced away after Payne booted the ball straight into his arms at point-blank range. Canada threatened again, but Ireland forced a turnover and raced the length, Keith Earls outpacing John Moonlight before floating a fine scoring pass to Rob Kearney. Earls broke again, this time through the centre, before sending Payne home for Ireland's seventh score. Ireland launched one further attack, Healy knocking on in attempting to ground for the score.